The Vollmer Space Program is a GO! 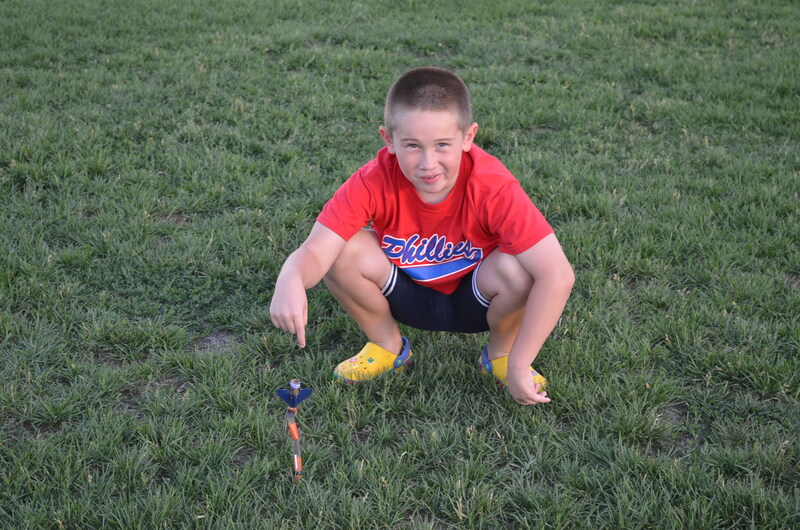 Timmy built a small rocket that had a lot of problems during construction, but ended up launching successfully not once, but four times! Twice it nosed right into the ground, but Timmy got it to launch again. 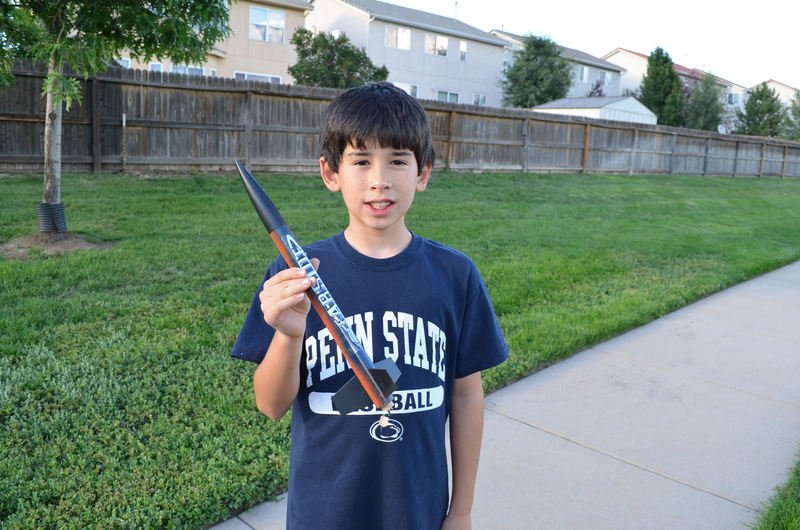 Jacob is very proud of his “Far Side” rocket. Earlier this week, I was hauling the boys on errand after errand all over Colorado Springs. One of the errands was a short stop at Hobby Lobby to “dry mount” one of Timmy’s Atlanta Braves posters. While waiting for the work to be done (about 15 minutes) I took the kids to the model crafts aisle. I thought they would look at the airplane kits, but they instead wandered over to the model rockets. About a month ago, when our friends the Goldmans were visiting from North Carolina, Timmy and Johnny had apples as a snack. Wait, there’s more! I promise! Timmy typically makes one pass around an apple, taking off the skin and any flesh underneath that the first set of bites will cover. Then he calls himself done. He doesn’t eat any part of the apple that doesn’t have skin in the same bite. Frustrating, but at least he’s eating apples. He eats 3-4 per week, can’t complain about that…. Johnny, on the other hand, is very good about eating as much of the apple as he can, and he left a minimal core behind, complete with the seeds exposed. Timmy had never noticed the seeds in the core before, and immediately wanted to plant the seeds from Johnny’s apple core. Amidst all the chaos of our friends visiting, I made Timmy set the seeds aside and promised to plant them when things had calmed down some. I needed time to prepare a place for the seeds to go and I didn’t want to do it yet. We had a planter that the boys made at Lowe’s last year, complete with a window in the front to let you see the root action. I had to clean out the dead carrot plant debris and refilled the container w/ fresh soil. We planted the two seeds on July 13th. I wasn’t optimistic. 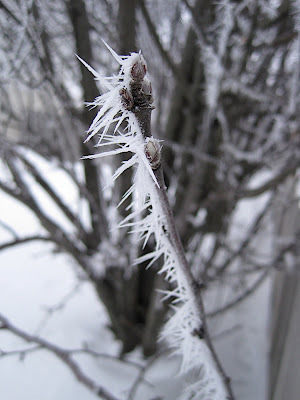 Again, I’m not optimistic…apple trees don’t typically grow in this part of the country. I have a large patio planter that we can use, if it comes to that. The pond has been doing very very well. The water is nice and clear, we’ve had very little issue for the past couple weeks, although the “hair algae” is starting to grow again, which means a manual scrubbing of the stone surfaces. I have to do this every 6-8 weeks as it is…no big deal, except it’s really hot outside! The goldfish are continuing to flourish and grow well. I guess that addage is true: goldfish will grow into their surroundings. As for the tadpoles, when the kids and I returned from New York, the three tadpoles each looked distinctively different from each other. One had his front and hind legs, one had long back legs, and the third one still looked like a tadpole. Here’s the one with the front and hind legs, he was stuck to the side of the Critter Carrier when I first saw him after getting back. You can see the one with only the hind legs just below him. Unfortunately, that well-developed one had passed away the following morning. Boo…so now we’re down to two. The one that only had hind legs on Sunday now has his front legs, and the most-tadpolish looking one has hind legs coming in. I’m now at an impasse about what to feed these guys — allegedly they transition from eating green matter to wanting more bugs and stuff. I might pick up some crickets at the store tomorrow. 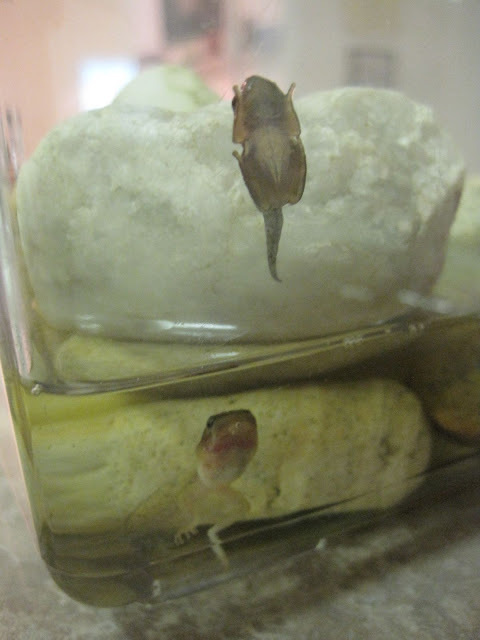 Last week I talked about bringing 3 tadpoles into the house as a mini-science lesson for the boys. Those tadpoles spent the weekend in a glass mixing bowl while all of our visitors were here. They swam around, eating fish food and leaving plenty of algae-green-colored droppings. You could see visible changes in their eyes and by the end of the weekend, the telltale legs had sprouted on the two largest ones. You can see one of the tadpoles in the center foreground, and there’s one in the center of the pack of the tank. This son-of-a-gun is LOUD at night. My condolences to all our houseguests who have to sleep in Jacob’s bedroom whose window is right next to this pond. And the fish in the pond seem happy. Unlike the two sets of koi we had, these folks come crowding over when I stand nearby, they know where their food is coming from, ha ha! My sister Margaret and her 3 sons were in town most of last week. It’s always really wonderful when my sister’s family visits. All 5 of our boys are almost like a pack of wolves, they rarely fight, and Margaret and I can talk talk talk talk talk talk talk…..
Ironically, the weather was fabulous for the 5-6 days prior to their arrival, and on the day they left, it was once again sunny and warm. They were greeted with windy, cloudy days, complete with a severe weather outbreak on one of the days! But that didn’t stop us. I’ll write about our chilly kayaking trip in my next post, but for now I’ll discuss the activity we did on the one day I took the boys out of school. 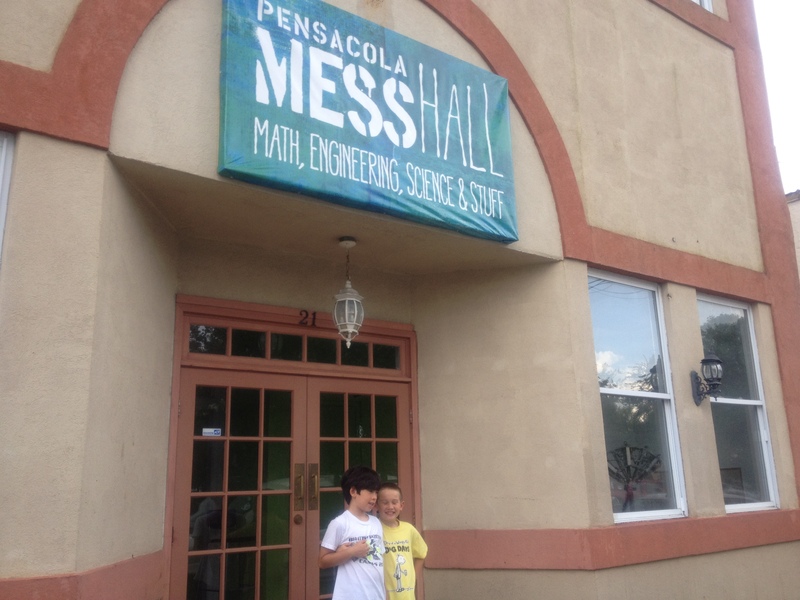 It thunderstormed most of the day, so we visited the Emerald Coast Science Center in Fort Walton Beach, which is about 30 minutes east of us. It’s a small operation, probably about 2 hours total to see the whole thing. And that was with 5 very curious, geeky boys. They enjoyed it just the same, they were especially interested in the hands-on activities, such as the bubble tables and the interactive health and anatomy areas. 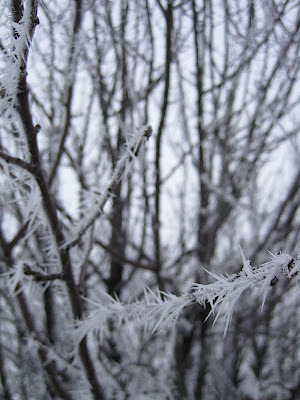 Enjoy some pictures from our afternoon. After we visited the museum, we met up with our friend Lisa who lived nearby. 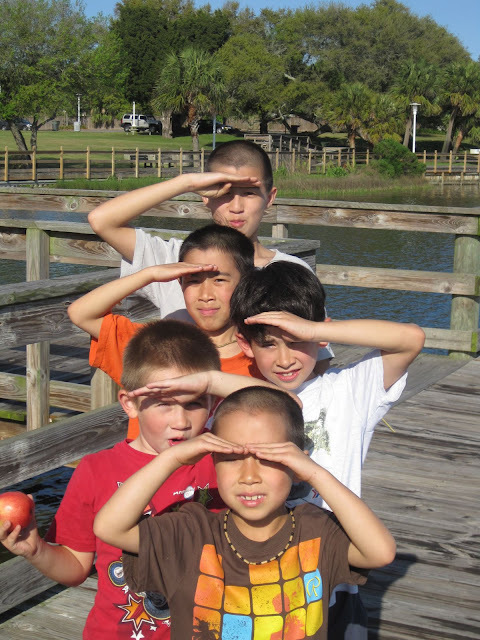 By then, the rain had stopped and the boys enjoyed a couple more hours at Fort Walton Landing park. Just off Highway 98 in old historic Fort Walton Beach. 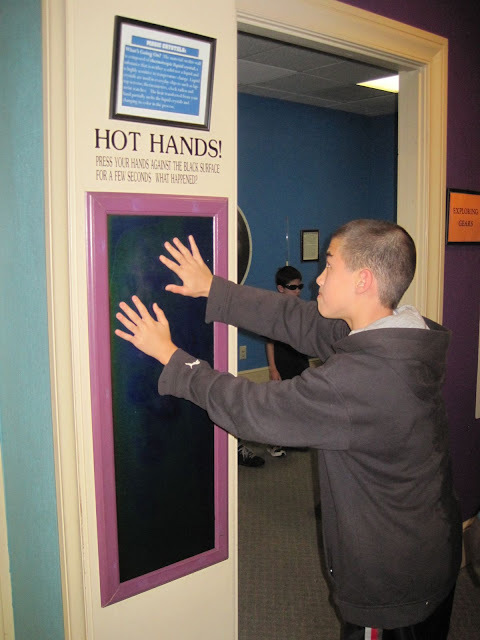 The kids didn’t seem to care that this “Hot Hands” exhibit didn’t really work anymore. Playing with the Van De Graff machine. 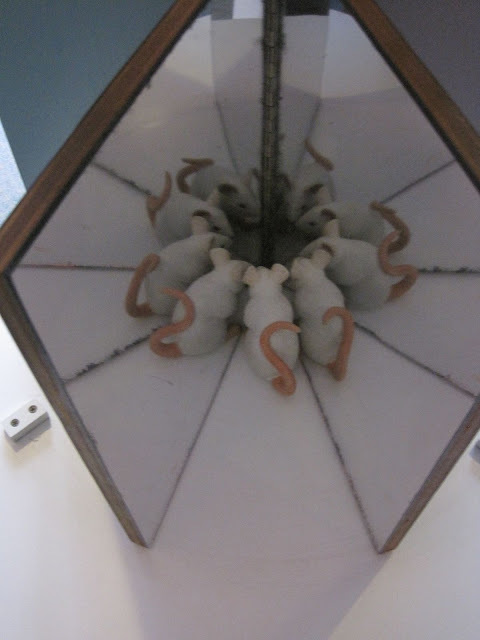 This was fun…you open/close the mirrors to make the mice multiply. 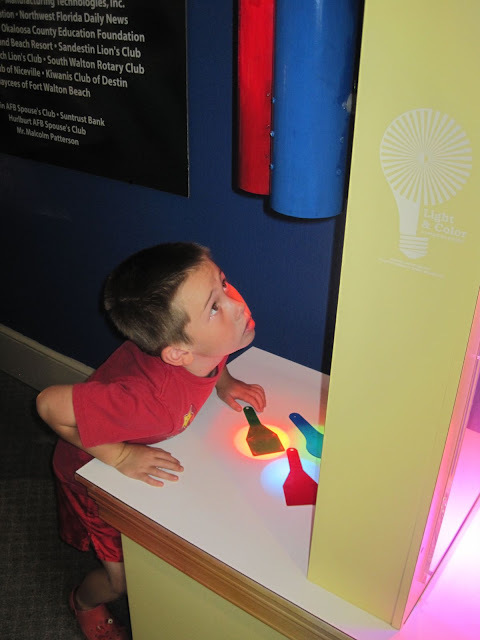 Timmy trying to figure out how the color lights work for this exhibit. The bubble room was by far the most popular area! 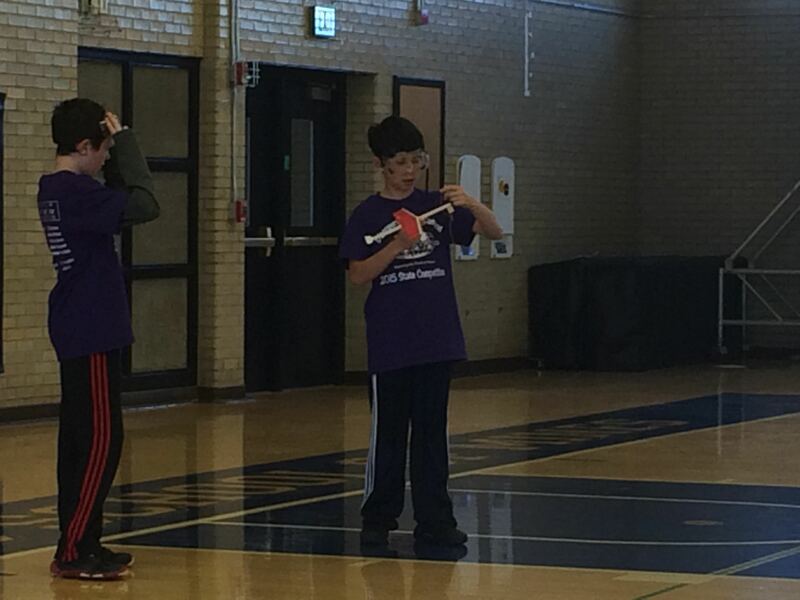 The boys were having contests to see who could make the longest bubble! 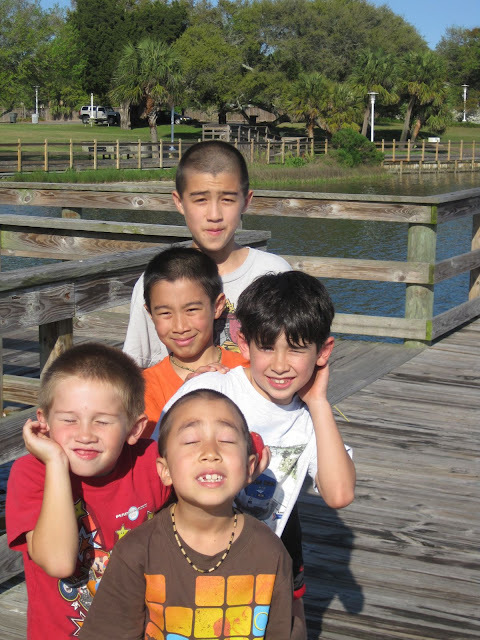 This had the makings of a really great picture, except for the little ones having their eyes closed…. 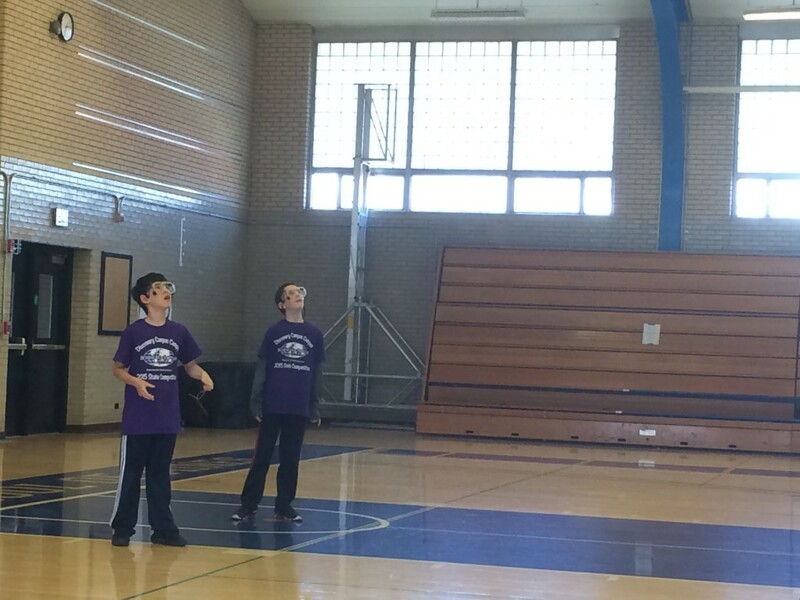 So we suggested they shade their eyes and this is what we got…. Nebraska Discoveries 17: Ashfall Fossil Beds & "Fossil Vacations"
A couple weeks ago, Jacob and I (Timmy was in NY visiting Grammy and Grampy) headed out with our friends and neighbors, Shannon, Brandon, Connor and Dean to the Ashfall Fossil Beds State Historic Park, which is near the small town of Royal, Nebraska. We had learned about it from our visits to Morrill Hall State Museum in Lincoln, there’s a room dedicated to the skeletons assembled from Ashfall, along with an advertisement for the facility. Ashfall isn’t close. About 180 miles from Bellevue, and well over 3 hours worth of driving each way. So Shannon and I aimed for a 7am departure time, and headed out.